Luckily, there are the privileged few who choose to volunteer their time, energy and resources to help improve the quality of life of those less fortunate, and they learn about other cultures while doing so. One such motivated young person is 17 year old James Ross Winston from Virginia in the United States. To him, the expression “there is a world out there waiting for you” was not just the scrawl on a bumper sticker. It was a desire he was itching to fulfil. He took full advantage of it when the opportunity presented itself in the form of the Noland Fellowship Grant. This is financial support presented once a year to one deserving senior at Woodberry Forest School to undertake a life changing project in a developing country. James travelled to Winneba in the central region of Ghana and volunteered for four weeks on the teaching project offered by Projects Abroad. During the first week at his placement, James oversaw the construction of the lab, which involved the installation of outlets, fans, lights, desks, windows and doors, and painting the walls. “It became more IT-centric during the second week with the installation of a projector, CISCO switch, ethernet cabling and the laptops. 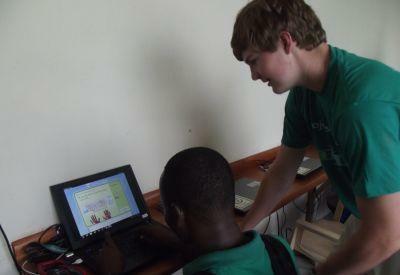 I also began the most rewarding part of my experience, which was teaching ICT to the kids.” James had a lot of responsibility handling virtually all aspects of establishing the computer lab.